Your typical airport bar is a semi-depressing place, full of lonely traveling salespeople and stressed passengers waiting out their flight delays. Happily, Munich—Europe’s beer capital and the spiritual home of Oktoberfest—is not your typical city when it comes to its bars. 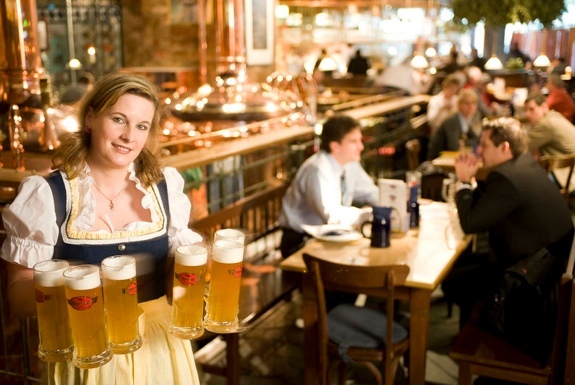 At Munich’s international airport you’ll find Airbräu. It’s the world’s only full-fledged beer garden that’s inside an airport. It’s also the world’s only in-airport brewery. To be sure, having a drink at Airbräu is no substitute going into the center of Munich and visiting a biergarten there. Though, considering the place is attached to an airport, Airbräu is extremely well done. One part of it is indoors with views of the brewery’s 530-gallon beer kettles and brew master Rene Rainer doing his work. The other half extends out into an open-air atrium; it operates from May to October, depending on weather. Airbräu has eight varieties of beer to choose from. Each is of high quality, though the beer’s most superlative feature has nothing to do with taste—a pint costs a mere €2.40, well below the average Munich beer garden price. Not incidentally, Munich Airport is a superb place to get stuck even apart from its beer garden. There are often special events happening; in the past the airport has hosted car shows, rock concerts, a beach volleyball tournament and a polo match. Europe’s largest hotel lobby is at the Kempinski Hotel, which is attached to the airport—it features real palm trees imported from Florida. From November to January there’s a large winter market at the airport, complete with an ice rink and over 300 Christmas trees. Childcare is available at the Air Berlin Kinderland. The airport’s 157 stores often have prices that are cheaper than what you’ll find in downtown Munich (especially when shopping for Swiss watches). And if all that’s too much for you, you can get some sleep in a Napcab. As for the Airbräu, it’s located in the Munich Airport Center between Terminal 1 and 2. There’s also a small Airbräu behind security in the departures area (level 05) of Terminal 2.